Select the data (including the column headings) in your table or list as a cell range in the worksheet. To preview each pivot table that Excel 2016 can create for your data, highlight its PivotTable button in the Quick Analysis palette. Excel 2016 then creates the previewed pivot table on a new worksheet that is inserted at the beginning of the current workbook. This new worksheet containing the pivot table is active so that you can immediately rename and relocate the sheet as well as edit the new pivot table, if you wish. The figures show you how this procedure works. In this figure, the third suggested PivotTable button is highlighted in the Quick Analysis tool’s option palette. The previewed table in the thumbnail displayed above the palette shows subtotals and grand totals for company sales for each of the three months of the first quarter organized by their sector (Retail or Service). Previewing the pivot table to create from the selected data in the Quick Analysis options palette. The next figure shows you the pivot table that Excel created when you clicked the highlighted button in the options palette in the preceding figure. 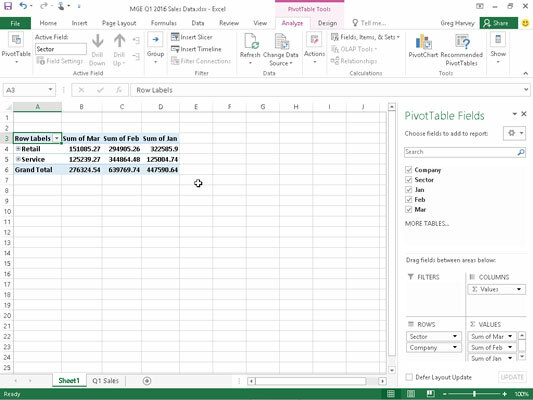 Note this pivot table is selected on its own worksheet (Sheet1) that’s been inserted in front of the Sales Table worksheet. 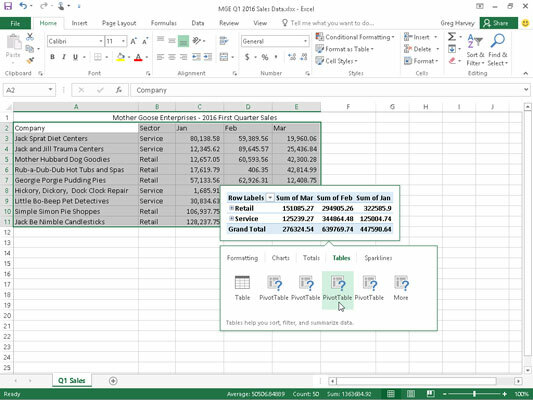 Previewed pivot table created on a new worksheet with the Quick Analysis tool. Because the new pivot table is selected, the PivotTable Fields task pane is displayed on the right side of the Excel worksheet window and the PivotTable Tools contextual tab is displayed on the Ribbon. You can use the options on this task pane and contextual tab to then customize your new pivot table. Note that if Excel can’t suggest various pivot tables to create from the selected data in the worksheet, a single Blank PivotTable button is displayed after the Table button in the Quick Analysis tool’s options on the Tables tab. You can select this button to manually create a new pivot table for the data.